Theory has shown that the probability of dissociation depends on the temperature of the QGP, so that the observation of a suppression of the J/ψ can be seen as a way to place a "thermometer" in the medium itself. Such a screening of the colour interaction, and the consequent J/ψ suppression, was first predicted by Helmut Satz and Tetsuo Matsui in 1986 and was thoroughly investigated over the following years in experiments with heavy-ion collisions. In particular, Pb–Pb interactions were studied at CERN’s Super Proton Synchrotron (SPS) at a centre-of-mass energy, √s, of around 17 GeV per nucleon pair and then Au–Au collisions were studied at √s=200 GeV at Brookhaven’s Relativistic Heavy-Ion Collider (RHIC). As predicted by the theory, a suppression of the J/ψ yield was observed with respect to what would be expected from a mere superposition of production from elementary nucleon–nucleon collisions. However, the experiments also made some puzzling observations. In particular, the size of the suppression (about 60–70% for central, i.e. head-on nucleus–nucleus collisions) was found to be approximately the same at the SPS and RHIC, despite the jump in the centre-of-mass energy of more than one order of magnitude, which would suggest higher QGP temperatures at RHIC. Ingenious explanations were suggested but a clear-cut explanation of this puzzle proved impossible. At the LHC, however, extremely interesting developments are expected. In particular, a much higher number of charm–anticharm pairs are produced in the nuclear interaction, thanks to the unprecedented centre-of-mass energies. As a consequence, even a suppression of the J/ψ yield in the hot QGP phase could be more than counter-balanced by a statistical combination of charm–anticharm pairs happening when the system, after expansion and cooling, finally crosses the temperature boundary between the QGP and a hot gas of particles. If the density of heavy quark pairs is large enough, this regeneration process may even lead to an enhancement of the J/ψ yield – or at least to a much weaker suppression with respect to the experiments at lower energies. The observation of the fate of the J/ψ in nuclear collisions at the LHC constitutes one of the goals of the ALICE experiment and was among its main priorities during the first run of the LHC with lead beams in November/December 2010. The ALICE experiment is particularly suited to observing a J/ψ regeneration process. For simple kinematic reasons, regeneration can be more easily observed for charm quarks with low transverse-momentum. Contrary to the other LHC experiments, both detector systems where the J/ψ detection takes place – the central barrel (where the J/ψ→e+e– decay is studied) and the forward muon spectrometer (for J/ψ→μ+μ–) – can detect J/ψ particles down to zero transverse momentum. As the luminosity of the LHC was still low during its first nucleus–nucleus run, the overall J/ψ statistics collected in 2010 were not huge, of the order of 2000 signal events. Nevertheless, it was possible to study the J/ψ yield as a function of the centrality of the collisions in five intervals from peripheral (grazing) to central (head-on) interactions. Clearly, suppression or enhancement of a signal must be established with respect to a reference process. And for such a study, the most appropriate reference is the J/ψ yield in elementary proton–proton collisions at the same energy as in the nucleus–nucleus data-taking. However, in the first proton run of the LHC the centre-of-mass energy of 7 TeV was more than twice the energy of 2.76 TeV per nucleon–nucleon collision in the PbPb run. To provide an unbiased reference, the LHC was therefore run for a few days at the beginning of 2011 with lower-energy protons and J/ψ production was studied at the same centre-of-mass energy of Pb–Pb interactions. The PbPb and pp results are compared using a standard quantity, the nuclear modification factor RAA. This is basically a ratio between the J/ψ yield in PbPb collisions, normalized to the average number of nucleon–nucleon collisions that take place in the interaction of the two nuclei and the proton–proton yield. Values smaller than 1 for RAA therefore indicate a suppression of the J/ψ yield, while values larger than 1 represent an enhancement. Fig. 1. A comparison of the J/ψ suppression between RHIC (PHENIX) and the LHC (ALICE). The ALICE results show a strikingly smaller suppression, in particular for head-on collisions (large Npart), despite the much larger centre-of-mass energy. 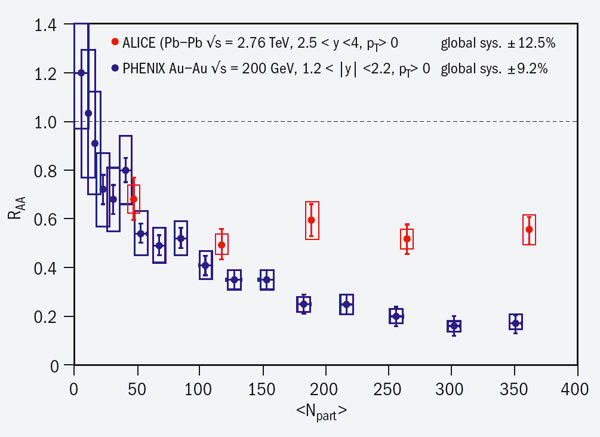 The results from the first ALICE run are rather striking, when compared with the observations from lower energies (figure 1). While a similar suppression is observed at LHC energies for peripheral collisions, when moving towards more head-on collisions – as quantified by the increasing number of nucleons in the lead nuclei participating in the interaction – the suppression no longer increases. Therefore, despite the higher temperatures attained in the nuclear collisions at the LHC, more J/ψ mesons are detected by the ALICE experiment in Pb–Pb with respect to p–p. Such an effect is likely to be related to a regeneration process occurring at the temperature boundary between the QGP and a hot gas of hadrons (T≈160 MeV). The picture arises from these observations is consistent with the formation, in Pb–Pb collisions at the LHC, of a deconfined system (QGP) that can suppress the J/ψ meson, followed by a hadronic system in which a fraction of the charm–anticharm pairs coalesce and ultimately give a J/ψ yield larger than that observed at lower energies. This picture should be clarified by the Pb–Pb data that were collected in autumn 2011. Thanks to an integrated luminosity for such studies that was 20 times larger than in 2010, a final answer on the fate of the J/ψ inside the hot QGP produced at the LHC seems to be within reach.